Jozi, the City of Gold, Joburg, Egoli … No matter what you choose to call South Africa’s largest city, Johannesburg has many faces and an indomitable spirit, shaped by its short but rich history – from its early gold-mining origins and the scars of apartheid, to uprisings, democratic elections and its growth as an African finance and business hub. Wondering where to start exploring this gritty metropolis? 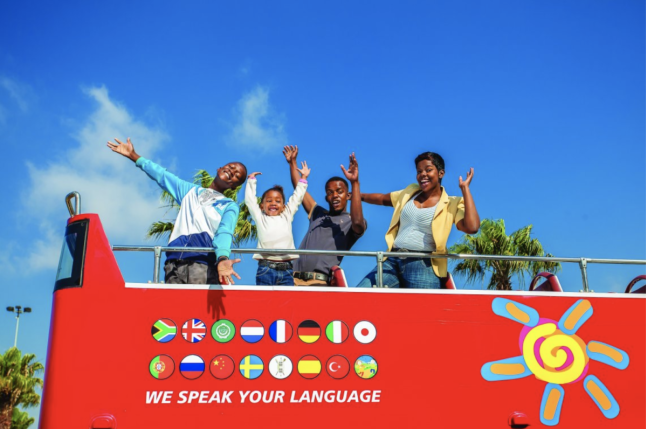 Simply hop onto City Sightseeing’s red bus – the easiest, most convenient way to see everything this multicultural melting pot has to offer. 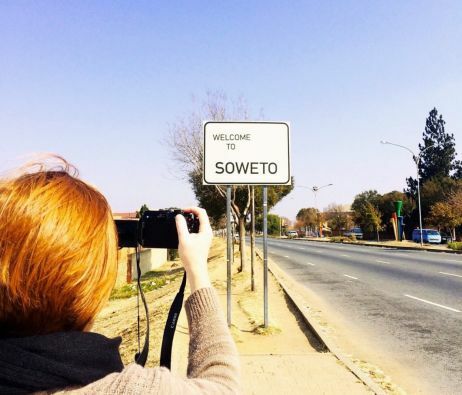 This is a tale of two cities: no visit to Jozi is complete without a trip to Soweto – originally created as the Southwestern Townships, but now part of the greater metropolitan municipality. If your time is limited, dip into the City Sightseeing route of your choice. But to get the full picture, set aside a day or two for three interlinking tours: the Johannesburg Green Tour, the City Tour and the Soweto extension tour. Start your itinerary in the commercial hub of Rosebank, with the circular Green Tour. Hop on at stop 1 near the Gautrain station and The Zone @Rosebank mall, and soon you’ll be looping through some of the city’s prettiest, leafiest suburbs. In summer, you’ll quickly understand why Johannesburg has a reputation as one of the world’s largest urban forests. Simply sit and watch the world go by from the open-top bus, or hop off at stop 2, Zoo Lake, where you can hire a paddle boat and row to the island with its many species of waterfowl. Stop 3 is at the sprawling Johannesburg Zoo (residents nearby can famously hear the lions roar), while the Ditsong National Museum of Military History (stop 4) has displays and artefacts relating to all the wars South Africa has been involved in. 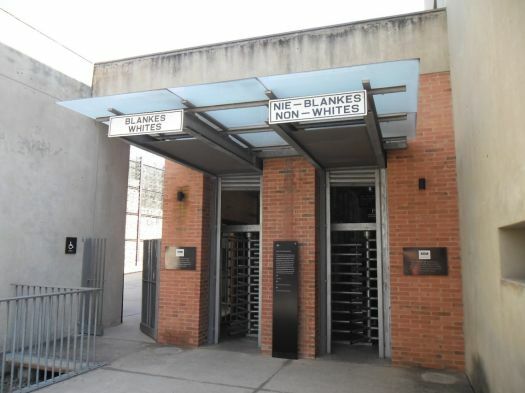 Stop 5 is Constitution Hill, home to South Africa’s proud Constitutional Court and a former prison complex – now a museum – where famous struggle leaders such as Nelson Mandela, Joe Slovo and Albertina Sisulu were once incarcerated. 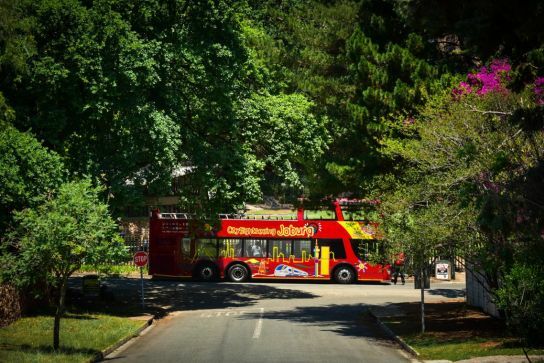 For an authentic taste of inner-city Jozi, use Constitution Hill as a springboard for the next part of your adventure: City Sightseeing’s City Tour. The historic mining district is your first destination (stop 10) on this route. From here, it’s on to the central business district and Africa’s tallest skyscraper, the Carlton Centre (stop 11), once home to the glamorous five-star Carlton Hotel. Hop off and head straight to the deck at the top – the views will make for a lasting Joburg memory. The James Hall Museum of Transport at stop 12 ties together a century of transport history. Then, it’s on to Gold Reef City (stop 13), with an underground gold-mine tour, a popular theme park, two hotels, restaurants, movies, entertainment and more. From Gold Reef City, either continue on your City Tour, or hop on the live-guided add-on minibus tour to Soweto for a three-hour snapshot of arguably the world’s most famous township. Soccer fans will immediately recognise the iconic Zulu clay pot-shaped FNB Stadium. Marvel at the enormous Chris Hani Baragwanath Hospital, the world’s third-largest medical facility with around 3 200 beds; reflect on apartheid and its tragic human toll at the Hector Pieterson Memorial and Museum in Orlando West; and then take in the colourful Orlando Towers (hop off here if the idea of bungee jumping, ziplining or abseiling appeals!). The Soweto tour also takes you to Vilakazi Street, Soweto’s most visited thoroughfare, to walk in the footsteps of two former residents and revered South African Nobel Peace Prize winners: former president Nelson Mandela and Archbishop Emeritus Desmond Tutu. The Soweto tour ends back at Gold Reef City, from where you may resume your City Tour. Stop off at the Apartheid Museum (stop 14). Exhibitions, photographs, film footage and artefacts chronicle the rise – and fall – of this odious system of institutionalised segregation. Continue to the SAB World of Beer in revitalised Newtown (stop 15). Hop off for a beer tour – and toast hard-won democracy. From here, there are two more stops: the fascinating Origins Centre at the University of the Witwatersrand (the world’s only museum of modern humankind; stop 16), and The Grove (stop 17), a must-visit on Saturdays when the trendy Neighbourgoods Market is in full swing. 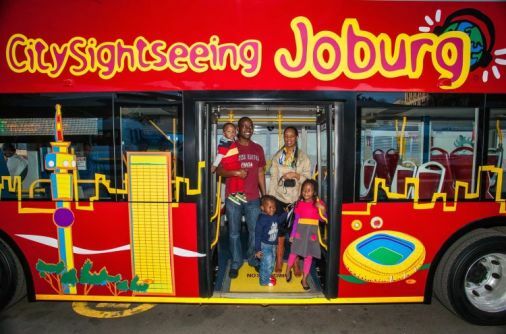 City Sightseeing’s red bus tours and Soweto add-on offer an easy, safe and relaxed way to see the City of Gold. For added convenience, there’s a free shuttle service from certain hotels in Sandton and Melrose to the Rosebank ticket office. Buy your ticket online and save. Your one-day ticket (R180) and two-day ticket (R280) both include all stops on the Green Tour and the City Tour, as well as the hotel shuttle. Add the Soweto component, and your one-day combo including all stops comes to R430 and the two-day combo to R530. The 3-for-1 Kids’ Special (valid on weekends, public holidays and school holidays, from 1 May to 8 October) allows two kids under 18 to hop on free with a paying adult.